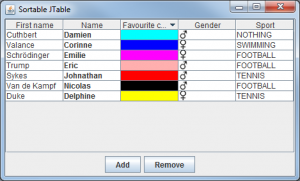 A JTable is a Swing component enabling the program to display a table formed of a certain number of lines and columns. 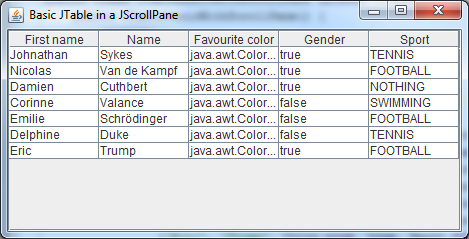 More than the content lines, the JTable has also a header line displaying a title for each column. 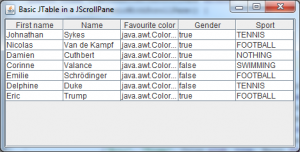 A JTable has data and header. We can see the data like a two-dimensional array in which all data correspond to the data of a cell and we can see the header's data like a unidimentional array of String. A model to keep the data. 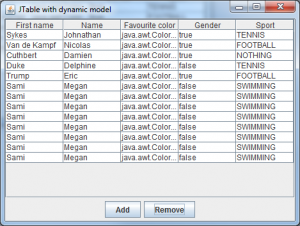 A JTable use a class implementing TableModel. We will see later how to specify a data model. A renderer for the rendering of cells. We can specify a TableCellRenderer for each column class. Once again we will see that later. An editor to edit the content of a cell. We can specify a TableCellEditor for each column class. We will start with a basic first version of our application. The easiest way, but not the best, is to use two arrays and to give them to the JTable constructor. We use the constructor JTable(Object data, Object entetes) to manage our data and headers. 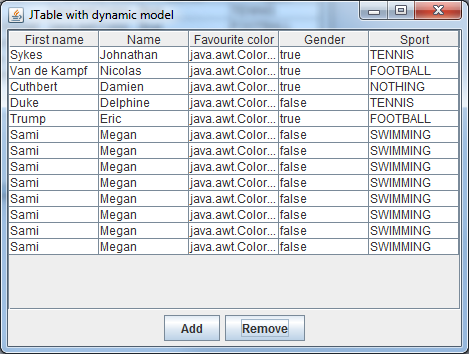 To add our table to a JPanel, we must add separately the header and the table itself. We cannot display more lines than the lines that can ben displayed by the window. We cannot manage the way the data are rendered. This version is already better than the previous, but this is not the best approach. We will improve it in the next chapters. int getRowCount() : Return the number of lines of the table. int getColumnCount() : Return the number of columns of the table. Object getValueAt(int rowIndex, int columnIndex) : Return the the value a the specified cell. Now, the code starts to be interesting. It's now that we start to understand the purpose of a model. Now, if we want change the order of two columns, we just have to invert them in the getValueAt() method, but this would not have been possible without a model. Once again, nothing change in rendering. In the next chapter, we will make our table dynamic enabling to add/remove friends of the table. We will now make our application a litlle more interesting and especially make our model essential. 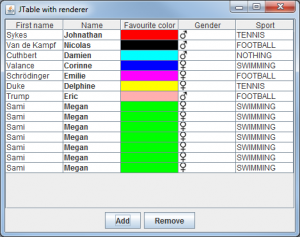 It seems give the user the possibility to add/remove lines of the table. We will see at chapter 6 how to edit the values of the cells. Nothing to hard. For the addFriend() method, we add the new Friend in the list and we inform the JTable of a new insert. For the removeFriend() method, we use the same principle, we start deleting the element from the list and we inform the JTable of the deletion. MULTIPLE_INTERVAL_SELECTION : several intervals of lines. This is the default value. We must understand than the array of lines returned by the getSelectedRows method can return several intervals. The results are returned in ascending order. We must delete them from the end to not change the line's number of the preceding elements. Like you can see, we just build a dynamic table without big problems. In the next chapter, we will solve the issues of Color and Gender column who are not really useful for the moment. Actually, this not really essential, because this is automatically made by AbstractTableModel. But i think, it's clearer. We will now create our renderers. A renderer is a class implementing TableCellRenderer who is an interface containing only one method returning a Swing component. In practice, we generally extends DefaultCellRenderer who use a JLabel as renderer. When it's possible, we must not create new object in a renderer if we've a lot of elements in our JTable. This would mean that a new object is created each time the table render a cell and that could degrade performance. That's why, we try to keep a single object modified each time we render a cell. This time, we have something a lot more interesting visually. You can also dorenderers more sophisticated with other components than JLabel like a JPanel of why not, a JTable. In the next chapter, we will enable the edition of the values of the table. The first method return true because all the cells are editable. The second return the modified friend and function of the column modify the good property of the Friend object. 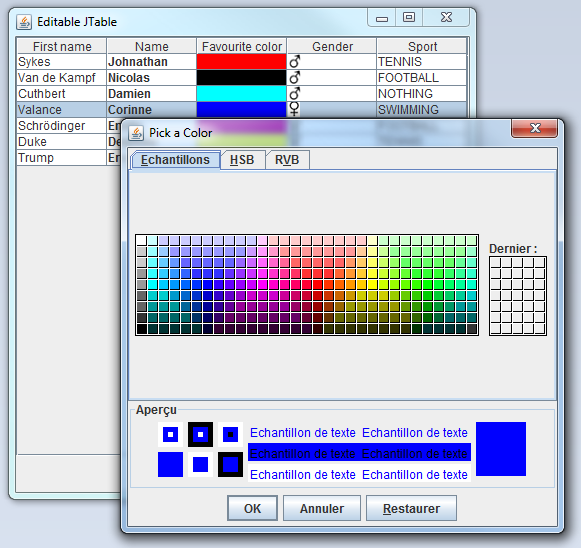 Now our model is editable, but this is not enough to work alone because JTable doesn't know how to edit Color, Sport or Gender by default. We must use a new concept, the TableCellEditor. An editor is simpley an object enabling to edit a cell. By default, JTable can edit directly all the objects with a JTextField and the Boolean with checkbox. In our case, it will work with the name and first, but doesn't work with the other columns. So we must create 3 editors. We can see that create an editor for an enumerated type is extremely easy. This time, we can see that it is a little more hard. The TableCellEditor itself is a JButton. The getTableCellEditorComponent method must return the editor component. The getCellEditorValue method retourne the edited value. We call the fireEditingStopped method when the edition is finished to say to the JTable to display again the renderer. We keep the simple principle than for color choice except that this time, its easier. We just have to invert the boolean value and return it. We've a now a tablea fully functional. In the next chapters, we will improve the table enabling to sort/filter the content of the table. This will sort all the column of class String in alphabetical order depending on the current Locale, the columns of a class implementing Comparable with their compareTo() order and the other columns with the alphabetical order of the toString() value. You can see that it's very easy to sort a table. But now, when the table is sorted, we will have problemsn to delete lines. You can try with the current code if you sort the table and then try removing lines. You will see that the removed lines are not good ones. What happens ? We start with getting the indexes of the views, then we convert them to indexes of the model. And finally we sort them to delete the elements from the end. You will see that with this new action the deletion of elements will work fine. At the next chapter, we will extends this feature enabling to filter the content of the table. 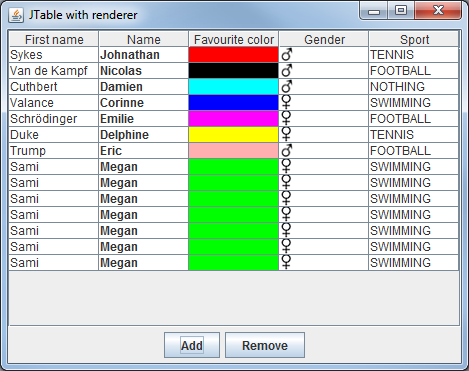 In addition to sort the table, the RowSorter class enable also to filter the content of the table. We can use for that the setRowFilter method who takes a RowFilter in parameter. 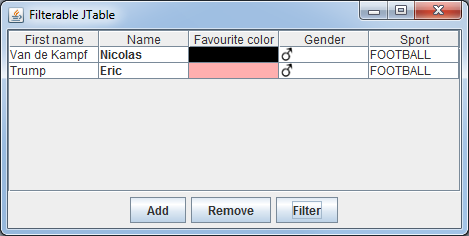 RowFilter has several static methods to easily create filters. So we have methods to make "and" or "or" operations on filters. Moreover we've also a very useful method to create a regex filter for one or more columns. For flexibility, you can also extends RowFilter who has only one methods include(Entry entry) who indicates if a line must be included in the table or not. Here we are. We have now covered all the main aspects of the creation and manipulation of tables (JTable) with Swing. I hope than this tutorial enable you to master this component who is, once the aspects undestood, not that hard to use.